Iconic British car manufacturer MG Motor UK has today (Wednesday, July 27, 2011) confirmed it will return to the forefront of international motorsport in 2011 as a partner of ambitious Le Mans Series contenders Team RLR. Following the successful launch of its brand new MG6 saloon, MG will renew its famous sporting heritage by becoming an official sponsor of Lancashire-based Team RLR as it competes in the prestigious Le Mans Series with the MG Lola EX265 sports prototype. The deal will provide MG with international branding opportunities across the team's car and other assets - including team kit, publicity material, website and social media channels. It will also see a two-way technical partnership established, and provide MG customers and associates with the opportunity to get up close to the world's highest level of endurance racing. MG's involvement in the 2011 Le Mans Series follows an outstanding record of success in endurance racing as a factory team between 2001 and 2002. 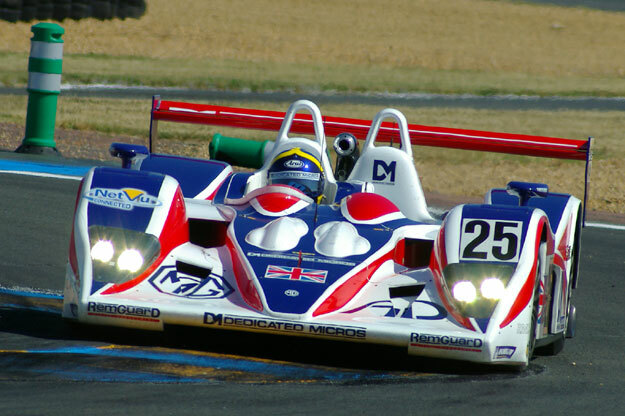 Then, from 2003 until 2008, RML AD Group took over the reins, flying the flay for MG in the Le mans Endurance Series and the 24 Hours, including two class wins at Le Mans in 2005 (below) and 2006. Team RLR drivers Barry Gates, Rob Garofall and Simon Phillips have contested all three rounds of the Le Mans Series in 2011 so far - including Le Castellet (France), Spa Francorchamps (Belgium), and Imola (Italy). MG will have an official presence with Team RLR at the remaining races, which will take place at Silverstone (Great Britain) and Estoril (Portugal). With the MG6 GT, MG6 Magnette and forthcoming MG Zero Concept providing a unique combination of stylish and sporty vehicles for the road, and now the MG Lola EX265 a regular contender in the LMP2 class of the Le Mans Series, the MG brand is once again capturing the imaginations of road car and race fans both on and off the track. Nick Reynolds, Team RLR team principal, said: "We have one of the best prepared teams in the Le Mans Series, and the support from MG will ensure that we can be even more competitive both on and off the track throughout the 2011 Le Mans Series season and beyond. The deal is a great fit for both parties and we are excited to be working closely with such a famous and much loved car manufacturer. We look forward to repaying MG for its confidence in us by providing many exciting moments for the company and its huge number of followers in the races ahead." Guy Jones, MG Motor UK Sales and Marketing Director, said: "MG is delighted to be supporting Team RLR and the MG Lola EX265, which is such a famous car. The MG brand is synonymous with motorsport and with the new MG6 GT and Magnette models now in the market place we need to raise the profile of the brand. Supporting Team RLR with the MG Lola in the exciting, high -profile, Le Mans endurance series is a perfect fit for the brand and the team."